Would I blog if no one were reading? If your answer is yes, then baby, you were born to blog — and more importantly, your blog is destined to succeed. Here’s why. We all know by now that blogging is an effective marketing tool. Building relationships, SEO, establishing contacts and the like. But at the same time, as a marketing tool, blogging is just about the most impossible and difficult platform imaginable. Churning out copy several times a week is no picnic, nor is putting an original spin on the same old, same old questions that everyone wants answered. Ghostwriting or canned content may seem like promising solutions, but they’re fraught with potential ethics problems . 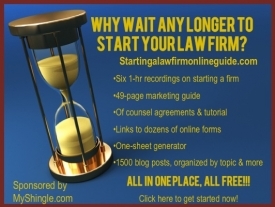 On the other hand, if you blog on more complex, business-oriented issues as I do over at my law firm blog, you can wear yourself out trying to summarize 200-page acronym-laden orders into a few paragraphs of polished copy. So despite the grand plans and GTD binders (Romney doesn’t hold a monopoly on use of binders in the workplace), after a few weeks or months, a blog started solely for the purpose of marketing will inevitably fall by the wayside. So before you jump into blogging because everyone is doing it, think about whether you have what it takes to get your blog up and running – and if not, no loss: there are dozens of other ways to find clients. But it’s different when blogging is a calling or compulsion. Something you do because you can’t not – either because you have ideas that your brain needs to unload or because you want to build a body of work or puzzle through a knotty legal problem that no one else is talking about or because you get a thrill from seeing your name in print even if no one else does. If that’s how you feel about blogging, then like the energizer bunny, you’ll just keep going and going. Like me. As the the ten-year anniversary for MyShingle (December 9 for those keeping track) nears, I’ve often asked myself whether to continue blogging or how long I can last, I’ve considered whether I should just stop or sell out and I’ve worried about when the day will arrive that the idea-well runs dry and I can’t eke out a post. But truth be told, one thing that’s never concerned me is whether my writings at MyShingle will become yesterday’s news; overtaken by some new upstart or lost in the deafening cacophony of practice management and ethics and how-to-start-a-law firm blogs that have proliferated like wildflowers – or weeds (pick your metaphor) across the blogosphere. Because honestly, it doesn’t matter. While I’d like to believe that my blog helps my readers, maybe even inspires them as my tagline itself aspires, my blog helps me more. MyShingle.com is one of the greatest pleasures of my day. It’s my outlet for venting, my memory book of my daughters growing up, my body of work and my legacy. If no one showed up to read MyShingle tomorrow or the next day or the next, I’d still be here anyway, writing about the policies that incense me, about the practice tips that intrigue me and most of all, the solo lawyers who never cease to amaze and inspire me . I’d be here every day even if no one read me at all, blogging my heart out, blogging by myself. That’s what makes me a blogger; that’s what makes MyShingle.com a blog.